The Leader 46 continues the expansion of this successful Leader line. 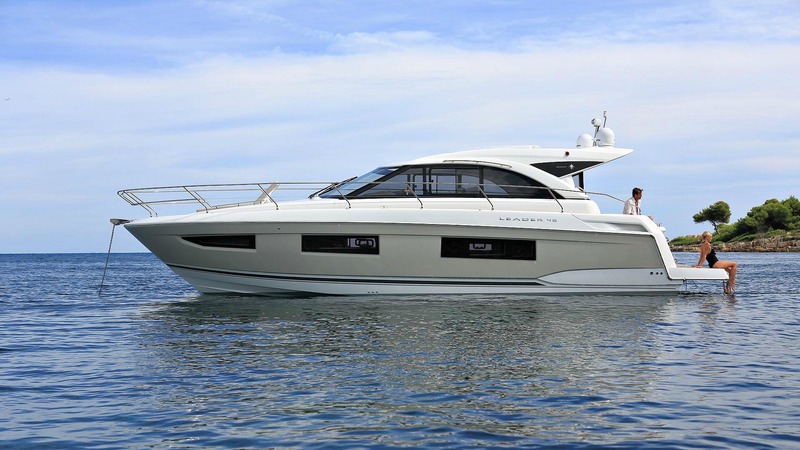 Available in stern drive or IPS this 2 cabin or 3 cabin 2 bathroom sports cruiser layout has some unique features that set it apart from the pack. The Leader 46 comes as an IPS diesel standard 2 cabin 2 bath layout but contact us for more information on cheaper engine packages and alternative cabin choices. Trim level premiere to include teak laid cockpit and swim platform, LED courtesy lights, folding teak cockpit table, white lacquered kitchen cupboards, cockpit spotlights, fresh water electric toilet upgrade, electric trim tabs and removable teak step at helm station. 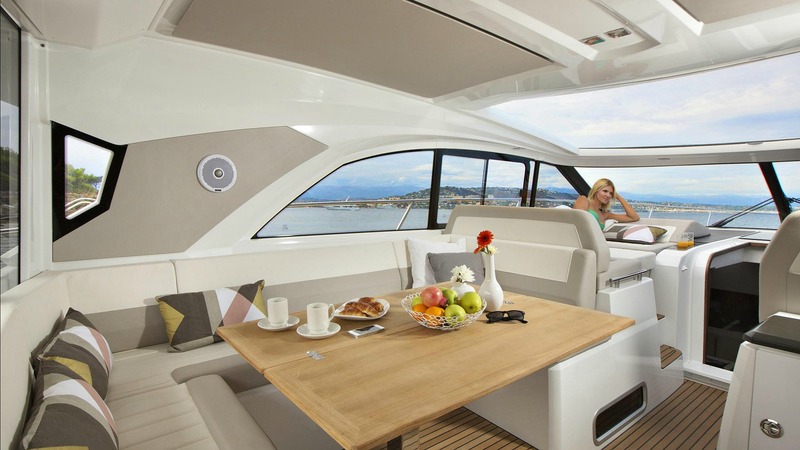 The spacious sport top is laid out on a single level and features a large, U-shaped saloon to port, a co-pilot bench seat that converts into a sheltered sundeck, as well as a very attractive cockpit galley. 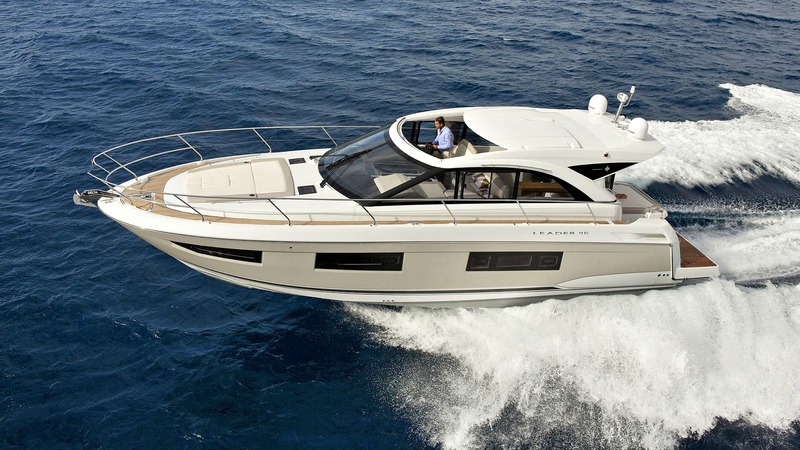 The opening roof on the sport top slides widely, instantly transforming the Leader 46 into a large open model. 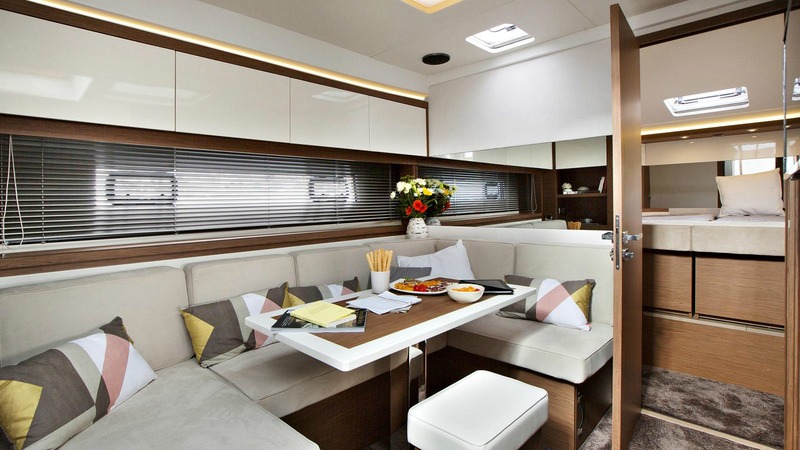 Luxuriously zen, the interior design of the Leader 46 will seduce you with her contemporary spirit that has been carefully studied down to the smallest details (wide windows in the hull, new design for furnishings, indirect lighting, new materials...). The guest cabin and private head & shower compartment offer the same luxurious details and overall comfort (berths may be separated, copious storage).